And look what they just added at Bar Victor. HTX has it’s very own Blek!!!!! Blek le Rat is one of the most well-known street artists in the world. He began his artwork in 1981, painting stencils of rats on the walls of Paris streets. He described the rat as "the only free animal in the city", and one which "spreads the plague everywhere, just like street art". His name originates from the comic book Blek le Roc, using "rat" as an anagram for "art". He has had a great influence on today's graffiti-art and "guerilla-art" movements, the main motivation of his work being social consciousness and the desire to bring art to the people. Let’s break down Houston’s coffee situation first! Weights + Measures : Weights and Measures is a casual neighborhood restaurant, bakery and bar located in a 1950s industrial warehouse. The project is the result of a long-standing partnership among four like-minded Houstonians: a developer, a bartender, a chef and a baker. The ultimate goal is to create a comfortable, sincere and welcoming place for Houstonians to dine, relax, socialize and share great experiences. And I love stopping by this cozy gem for locally-roasted Amaya coffee, and fresh juices. Boomtown: This coffee shop was formally The Honeymoon and I do have to say I miss it if I am being 100% frank. On a recent visit we visited Boomtown and the coffee was still delightful is why I am including them in my guide. But I miss the ambience of The Honeymoon. You will still get a great Instagrammable moment outside! Tout-Suite- I love the variety of coffee drinks I can find here like the turmeric and charcoal lattes. They also serve great organic teas! 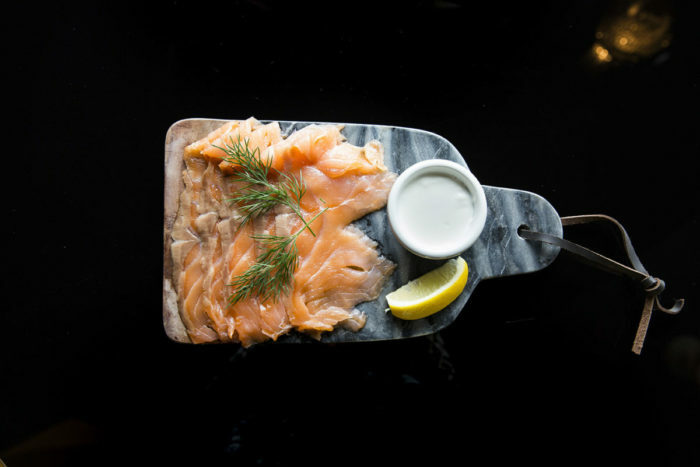 Blacksmith - Blacksmith serves up specialty coffee and quality food with exceptional service. The coffee shop lives up to its name by making as much as possible by hand and seeking out the best purveyors for the products they sell. Because of this approach, Blacksmith has become a hub for Houston’s creative class. Common Bond- Rustic-chic cafe & bakery with acclaimed chefs creating sweet pastries & seasonal savory dishes. I love sipping coffee on their patio while people watching in Montrose, one of my fave neighborhoods in Houston. 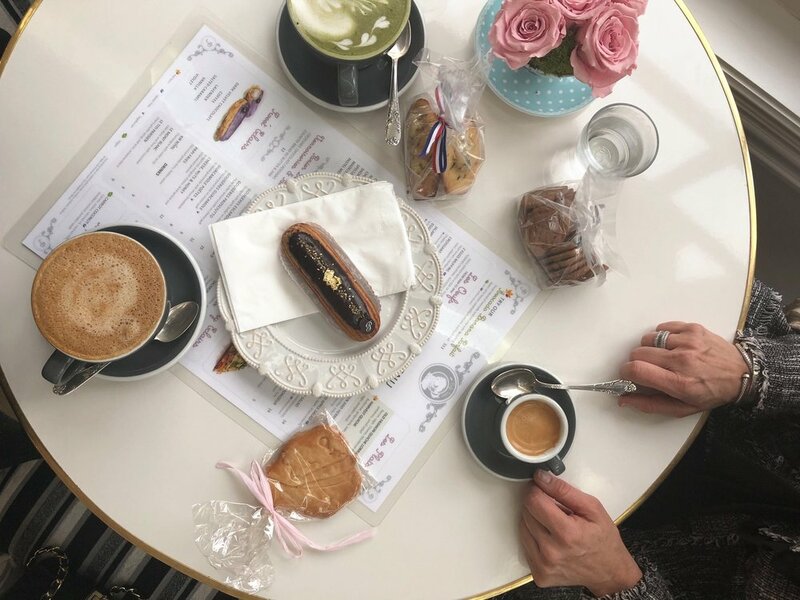 Café Poêtes- Adore this beautiful French Cafe & Wine Club in the Heart of Midtown Montrose also represented by the fab girls over at Endicott & Company PR. Café Poêtes is the vision of Karine Favre-Massartic and she is lovely. Café Poêtes is a contemporary interpretation of a Parisian café. A landmark of the past and present all at once. The idea of this particular hotel style originates from "The Orangerie" de Bagatelle built in Paris in 1835. Like a Paris café, Poêtes has a full kitchen and baker offering an inventive menu with delicacies for anytime of day. They have a hand-selected offering of wine. And of course, their signature éclairs. Shelves full of books compliment the light and airy atmosphere where you can escape and forget about time. Not only do have sweet eclairs but they have savory eclairs as well. And I am in love with the Violet eclair. And the harvest latte was incredible. Karine made us her matcha lavender latte too! Just look at this menu. Downhouse: Who says that restaurants have to have bad coffee? Who says that bars have to have bad food? Who says that coffee shops can’t have great food or alcohol? It would be the mission of DH to serve professionally executed specialty coffee, a chef-driven menu, and a quality focused craft bar. Plus the interiors are sooooo pretty!!! This is one of my fave places to spend the whole day working actually! And now for some booze! Bar Victor: Was honored to work with the amazing people over at Endicott & Company PR who represent Bar Victor which is owned by a French businessman. Loved being hosted by the swanky @barvictorhtx and if I lived here in Houston, I would be here every weekend . Fazz is such a dear! We had the best filthy martinis with house made blue cheese olives and the most delish sharing board with meets and cheeses and French jam!!!!!! 🇫🇷🇫🇷 In the heart of Houston, on Montrose Boulevard, between France and the West Coast, you will find Bar Victor. Sitting comfortably on the velvet bench seats, inside the intimate atmosphere, you’ll experience a true journey of the senses through the decor, the decidedly French inspired menu, the event programming or simply the musical ambiance. Victor’s aim is to promote a French notion of good living, based on sharing, traveling, epicureanism and music. Here, you will discover quality products and delicious cocktails. Here, you will discover French delicacies and delicious cocktails. Their resident DJ, Franky Boissy, will step in and take control of the decks. On Wednesday, at apéro time, keep on travelling with “LA FRENCH”, French music and its influences and on Saturday, “CORPS ET ÂMES” (disco music) will get you moving. The Black Labrador: I adore spending a lazy happy hour here at The Black Lab— this cozy little pub located beneath the Campanile tower on Montrose Boulevard. Friday and Saturday nights come alive as fans meet upstairs at the Cezanne piano bar for some of Houston’s finest jazz performances though if that is more your speed. Old Blue House Antique Shop: Love a good treasure hunt?! This place is for you! More Than You Can Imagine: Love luxury brands at a fraction of the cost?! This luxury resale shop is heaven on earth! I always find some luxury treasures. Their Chanel inventory is drool worthy! Cheeky Vintage: One of my favorite Vintage shops in the world. Tina Davis carefully curates each piece, only choosing the most pristine, drool worthy second hand treasures. They buy their pieces outright but occasionally consign. Their collection includes designer pieces from the 40’s – 90’s however, they love unlabeled pieces as well! The Guild Shop-Tucked into a cozy warehouse on Dunlavy sits a Houston treasure. Racks upon racks stuffed with the kind of diversity that makes up Hosuton—blue jeans here, St. John suits there—sit among cases of fine jewelry and fun baubles. I always find some serious designer scores here. I cannot even believe I am sharing it here so ya’ll save me some treasures please! Voted the city’s best resale shop on numerous occasions, The Guild Shop is filled with just the kind of things that keep regulars coming back: mid-century modern furniture and high-dollar art are some of the store’s biggest draws, as are the gently-used designer items like a recently-spotted Louis Vuitton Speedy bag for a third of the cost. The trick to finding what you’re searching for, says Executive Director Louise Symmes, is to come back daily. Kulh-Linscomb- Kuhl-Linscomb searches for products worldwide and are known for their style, taste, discernment, strict editing, product mix and the "best of the best" brands in each category. Kuhl-Linscomb represents more nationally and internationally known design and lifestyle products than any other Houston store. There is something for everyone here. I especially love it around the holiday season for that reason because I can put a major dent in my “nice-list’ here. There is a ton to look at so take your time and plan to spend some time here! Atelier Aliénor- I was introduced to this lovely brand by my friends over at Merchant & Market. (Merchant & Market is currently not doing a pop up shop but stay in touch with them because when they do-it’s truly the best of the best) Laurie Cazaux, the founder is such a lovely chic woman! Atelier Aliénor offers timeless espadrilles for women. They are made in the south of France with the most premium materials and finest craftsmanship. 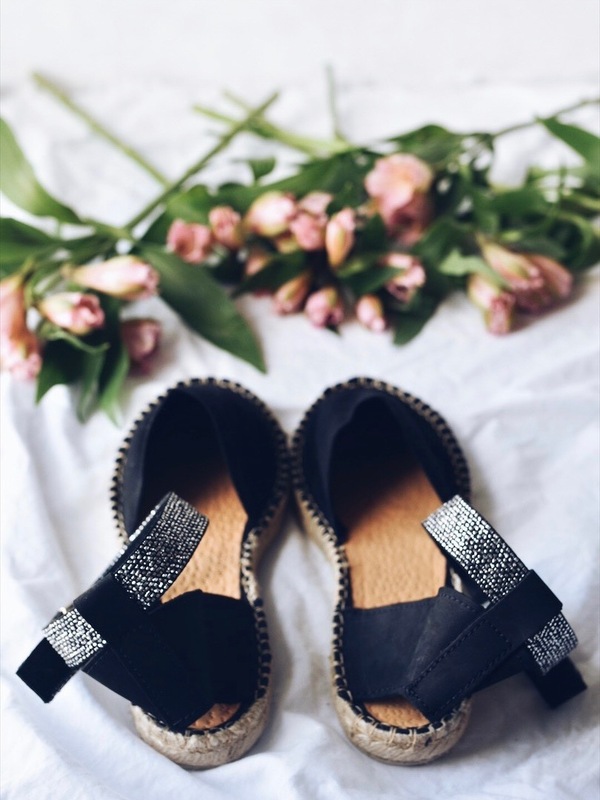 Atelier Aliénor was launched in 2017 with the ambition of making high quality espadrilles available at a fair price and celebrating French savoir-faire. 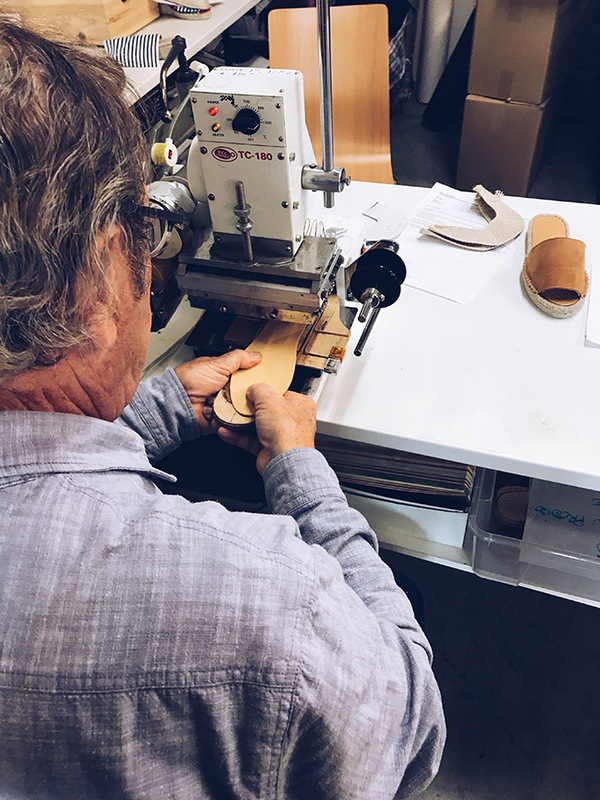 They sought out factories in France that have grown through generations with expertise and that share their dedication to protect the environment.The classic design of the espadrille was revisited with finely curated lines, feminine details and premium materials to offer their customers the finest shoes. They source the most gorgeous leather from a family-owned tannery in the south of France that works with the world’s most luxury couture ateliers. Thompson + Hanson- Their Stone House location in River Oaks has been home to Thompson + Hanson for over twenty years. Located just adjacent to Tiny Boxwoods, the nursery and shop spans winding paths and thoughtful displays, dappled with the soft shade of live oak trees. This peaceful refuge is a joy to explore and a truly transcendent shopping experience. Their Ivy House is a charming outpost tucked away in Houston’s idyllic West University Place. The shop happily sits between Tiny’s Milk & Cookies and Tiny’s No. 5, offering the perfect place to browse and be inspired on either end of a meal or sweet treat. Whether wandering through rows of flowers and fragrance, browsing carefully curated pieces in the shops, or simply savoring the view in the shade of an oak tree, their hope is to provide an experience that puts you at ease, surrounds you with beauty, and leaves you inspired.I am obsessed with their candles, cards, and handbags!! They have the best baby shower gifts too! Renovate- Lin’s sweet momma Jan introduced me to this Spring Branch neighborhood gem! Renovate offers unique items for the home, including furniture, accessories, and gifts. Burdlife- Burdlife owner and jewelry designer Natasha Dadwani has curated a collection of local and international artisan goods at her three-month market, BURD + BURDIES, in River Oaks Shopping Center. and we were introduced to Burdlife over the most recent Christmas holiday. The earrings are exquisite! The pop-up is no longer open but I highly recommend keeping up with Natasha to see what she does this year and of course, you can always shop her jewelry pieces from her website! Le Labo- Le Labo has always been a fave brand of mine that I purchased from Barney’s or on-line but whenever I get the chance to visit a free-standing Le Labo store, I do! You know how your palette changes & evolves? Your olfactory sense is no different. For those in search of interesting, layered fragrances I'd recommend Le Labo! There's nothing over the top or pretentious about this Montrose spot. Walk in and you're greeted by knowledgeable sales staff. Someone will patiently answer your questions as you smell everything (thrice). From having your perfume mixed on the spot to selecting a personalized printed label for your bottle, it's a special treat.Their complex fragrances may not speak to everyone, but for me, the sirens have whispered and my infatuation is deep. Of course stroll all the high end fabulousness at The River Oaks Shopping Center. And walk around Rice Village for some local flavor. And there is ALWAYS something new happening in Houston! Houston has a crazy good art scene! Some of my faves are.. Contemporary Arts Museum Houston, The Museum of Fine Arts, Blaffer Art Museum, Moody Gallery, and The Menil Collection. The Menil Drawing Institute is a super dreamy space to get some good pics too ! It’s the fifth art building to join the Menil neighborhood! The Menil Drawing Institute was established in 2008 to further the study of modern and contemporary drawings, and since that time it has organized important traveling exhibitions including Richard Serra Drawing: A Retrospective (2012) and Lee Bontecou: Drawn Worlds (2014). Additionally the forthcoming six-volume catalogue raisonné of the drawings of Jasper Johns has been produced under the auspices of the institute. Recognizing that the museum’s artist-centered approach and growing collection of drawings offered a singular opportunity, the Board of Trustees chose to incorporate a building dedicated to modern and contemporary drawings into the Menil’s institutional master plan. Los Angeles-based architects Sharon Johnston and Mark Lee (Johnston Marklee) were selected to create a distinctive freestanding structure dedicated to the acquisition, exhibition, study, conservation, and storage of these artworks. The unique 30,146-square-foot building features a trio of spacious courtyards and a design that modulates daylight in a way that both illuminates and protects delicate works on paper. Significant gifts have been instrumental to the Menil Drawing Institute’s early and continuing success, and the Menil has now established a special acquisition fund for modern and contemporary drawings. Be sure to check out the Rothko Chapel. Admission is free but donations are appreciated. Every visit is its own unique experience, building on the one that came before it. Please take care to respect the Chapel and its visitors by preserving the silence within the Chapel, refraining from using cameras, and maintaining a safe distance from our beloved artwork. Water Wall- The Gerald D. Hines Waterwall Park, located at 2800 Post Oak Boulevard, is 2.77 acres and features a 64-foot semi-circular architectural fountain that re-circulates 11,000 gallons of water per minute as it cascades down the water wall structure’s inner and outer walls. The Hines Waterwall Park, surrounded by 186 live oak trees, has been and will continue to be the community centerpiece for Uptown Houston, the nation’s 14th largest mixed use business center. Suzanne Deal Booth Centennial Pavilion, James Turrell's Twilight Epiphany Skyspace- Built in 2012, the pyramidal structure accommodates 120 people between two levels. Twilight Epiphany is acoustically engineered to host musical performances and to act as a laboratory for music school students on select days after sunset. Constructed of grass, concrete, stone and composite steel, the structure is equipped with an LED light sequence that projects onto the ceiling and through an aperture in the 72-foot square knife-edge roof just before sunrise and at sunset. Turrell's composition of light compliments the natural light present at twilight, and transforms the Skyspace into a locale for experiencing beauty and reflective interactions with the surrounding campus and the natural world. Viewing times for the sunrise and sunset light sequences, along with reservation and logistical details, can be found on our Visit page. This is one of my fave things in Houston! BAPS Shri Swaminarayan Mandir- Worth the drive, I promise. The Mandir is a place of worship and prayer for followers of Hinduism. The structure itself is built according to the Shilpa Shastra, a collection of architectural treatises that have been an integral part of Indian architecture and engineering for thousands of years. The sacred images and ceremonies of worship in the Mandir form the very core in elevating the soul to the pinnacle of God-realization according to Hindu philosophy. Swaminarayan Mandirs, worldwide, fulfill the ancient and lofty concept of the Hindu tradition of Mandirs. Understanding Hinduism - A Unique Exhibition: The exhibition describes the glory and greatness of Hinduism and the significant contributions by India in all fields. The public can see the universality of Hinduism, discover the Origins of Hinduism, understand the Hindu People and their Beliefs, marvel at India's Contributions to science and mathematics, experience the Continuity of Hinduism, and enjoy the Peace offered by a traditional Hindu Mandir. The ancient wisdom is presented through appealing visual effects, paintings, tableaux and traditional craftwork. It represents India's contributions in the fields of mathematics, astronomy, medicine, education and religion. The illustrious heroes of faith and culture such as Nachiketa, Shravan, Rantiedev, Sitã, and many more reflect the core of Hindu ethics and culture. Souvenir Shop:The Souvenir Shop is located in the front of the Mandir. It is filled with a wide selection of books, postcards, CDs, DVDs, herbal health products and gifts for all ages, tastes and budgets. Discovery Green- Just going to let this link speak for itself!!! Houston Graffiti Building- Grouping of industrial structures featuring rotating displays of colorful street art & murals. 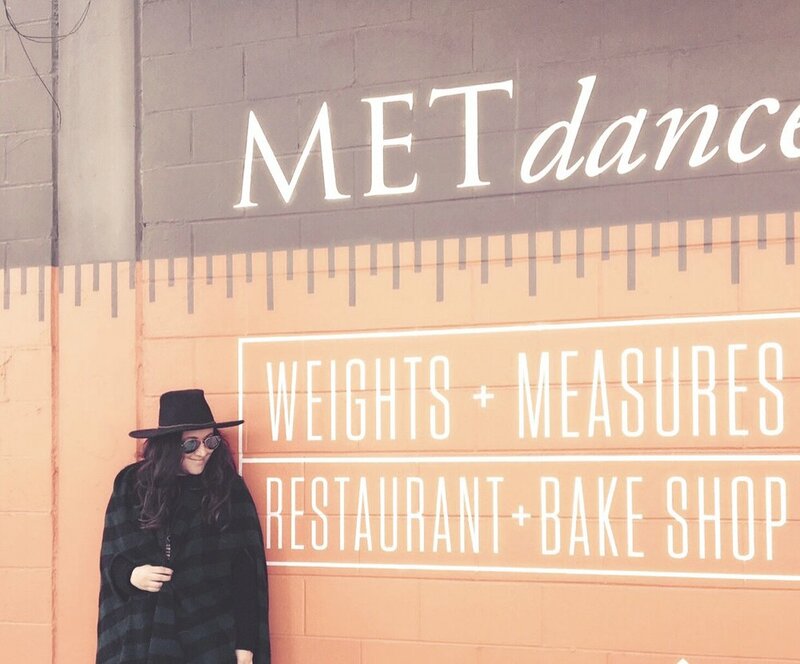 Have so much fun and remember to check out my Travel Guide: Houston Texas And It’s Most Instagram Worthy Spots-Stay & Dine Edition!